I fully admit that I'm someone who can not fully grasp the joy of "free time". I'm goal orientated even if I don't have a goal in mind. (And yes, I find this as annoying as you). If I'm pushing my stroller then I'm going somewhere. If you find me sitting in the park on a beautiful sunny day then I'm waiting for someone. I truly admire those individuals who think to themselves, "Hey I've got a free morning why don't I grab Tolstoy and head to the cafe for crepes and lattes". Alright, "admire" might be stretching it. What I'm really thinking is "unemployed". But here's the thing - I'm wrong! I know some of these people and they really are simply embracing their free time by looking like a snapshot from a Paris postcard (sans enfant). It's my own fault really. I could just head to the corner and have a coffee. Only problem is I know I'd be thinking...why am I here? I have an HOUR. I should be getting a massage, or my nails done or some other service that causes me great pain with the hope of after glow. I had such a thought today while Christmas shopping. I stopped for a pedicure. This was indeed a luxury since no one is seeing my feet anytime soon. It's so cold right now that I wear socks to bed. I just thought - hell yes! Bring on the foot scrub! My feet now feel like the inner part of my arm that is never exposed to the sun. Why? Because she basically blow torched my feet with hot coals. She was smiling the entire time which, well, kind of weirded me out. I was immediately reminded of a time (way back when after the first kid) that I decided to go to this Nordic Spa and get a "treatment". It was called a "deluxe sweet ginger body glow". It was a birthday present and I was thrilled. That is, until I was led into a room with a steel table that was illuminated by a bare bulb. And attached to the wall was a garden hose. I kid you not. 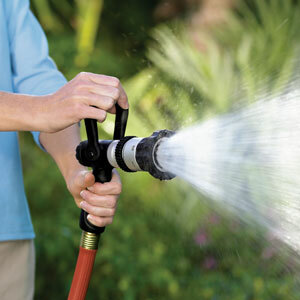 A garden hose with a nozzle. You know those nozzles with various settings that allow you to water your garden depending on your mood? And trust me, the lady who was giving me my service did not look happy. I started to feel like I was in an episode of Dexter. But at least Dexter sticks a needle in the neck of his victims before he gets going. All this lady did was throw me a paper thong and tell me to get on the table. You know you're really not having a great time when you start thinking about the Holocaust during a treatment that costs a bundle. By the time the garden hose came out I really started to feel like this woman's car. Not a luxury automobile either. Just some crappy old Ford Taurus from the 80's with a thick layer of mud on it. Truly, I'm surprised she didn't light up a cigarette while she upped the intensity on the nozzle and aimed it at my mid-section. But as usual...as I limped out of there...and I thanked her profusely for her time. Why? Because my skin looked UNBELIEVABLE. I was basically glowing. Imagine that! And all it took was being shamed on a steel table with a garden hose! Next time I'll use my free time to do something much less painful yet equally satisfying...like doing the laundry: take a towel out of the dryer half way through the cycle and it really provides a nice face steam. Dammit, I guess I should return that gift card for the spa treatment. I watch Dino Dan with my kids and they love the show. Hope to see new episodes in the future. Ok,I know I'm not the only dad sitting there with the kids watching Dino Dan and thinking that Allana is attractive! Jennifer Aniston-watch out! You are not...your blog made me laugh out loud. Needed that, thank you!